a collection of Patrik Fitzgerald's Small Wonder and Polydor releases. A combination of punk's outrage with a streak of optimism, rare for its time and place. Collected for the very first time on a double LP package. Patrik Fitzgerald was one of the oddities that punk rock threw up in 1977. A lone singer with an acoustic guitar regaling punk audiences with lyrical songs and interspersing them with chats, stories and poems. Is this what people died in the Punk Wars for? The answer is an emphatic yes. There's no better example of the punk DIY attitude than the lone, slight figure of Patrik Fitzgerald making it happen and expressing himself on stage. Singing songs of alienation, observation and imagined situations and often braving hostile receptions to communicate with an audience. While bands had the safety net of each other and the bombast of volume and wattage, he stood alone. Patrik had realism, pathos and incisive, sometimes uncomfortable, lyrics. Those early songs like 'Safety Pin In My Heart' and 'All Sewn Up' have amazingly stood the test of time and sound as relevant today as then. Patrik Fitzgerald was the 'Punk Poet'. He is the great forgotten songwriter from the Class of '77. Patrik Fitzgerald never became a household name or punk icon like Rotten, Strummer or Weller, but to his loyal followers he is just as important and as inspirational. Same goes for Mark Perry, Vic Godard and Robert Lloyd. Like them, he is one of punk's idiosyncratic, singular voices. Artistically successful, but too uncompromising for mainstream and commercial rewards. 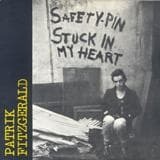 Fitzgerald's sincere attitude and eccentric appearance - commonly, a badgecluttered blazer, red drainpipe trousers and sandals - set him squarely apart from his new wave brethren. He was always called a poet rather than a singer, as it was all about the words. Words full of tragedy, comedy, cynicism, realism, bitterness, pathos and just occasionally, hope. Tagged the new Dylan in '77, he was maybe more the new Leonard Cohen with a touch of social realism, although Bowie was his hero. "The recordings remain true to me, even when I don't. This is what they are; the voice of a small, insecure, somewhat lost person, living in a small, insecure, somewhat lost country."